Bill and I are in New Mexico this week. New Mexico is always full of food, fun, friends and family. In reverse order of importance, but we’re lucky in that we normally get food and fun with friends and family. This always involves the consumption of some amount of green chile or red chile. Oddly, we both tend to vastly prefer red chile – except that I think scrambled eggs & green chile are an unbeatable pair. Bill thinks I’m crazy. However, there is one food tradition Bill and I always engage in, and we’re almost always alone when we do so. Unintentionally so, but basically it starts while Bill and I are driving around, probably without a specific destination in mind or we have quite a bit of time before our next engagement. Bill: Oh, look! Talin. Jason and I used to shop there all the time. Bill: I kind of want to go check it out. Bill: Nah. We really don’t need anything there. And then we go exploring and find all sorts of interesting things. For example, in the German aisle, we found this pasta. “Tacos”? Why in the world are they calling these shells “tacos”? I honestly have no idea. Neither does Bill. Furthermore, why the German aisle? Do the Germans call “shells” “tacos”? I somehow doubt it, but I suppose it’s possible. I honestly suspect strange translation error. Still, it’s strange. 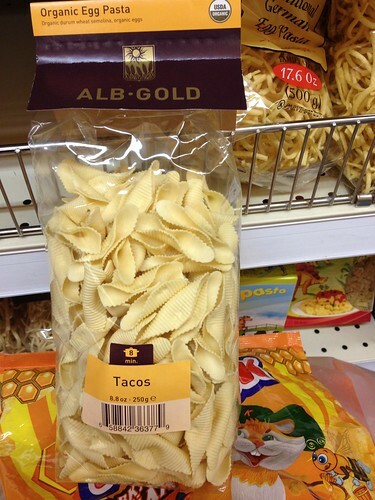 Of course, as I look closer at the picture, they do kind of look like little pasta tacos. Which is also weird. I have never seen taco pasta before. Now I wonder if we should have purchased them and tried to make pasta nachos or something. Anyway. Bill and I always buy at least one or two things from Talin when we go in there. However, this time we went a little crazy. I’m not actually sure why. I’m going to chalk it up to a strange love of beverages. And chocolatey cookies. 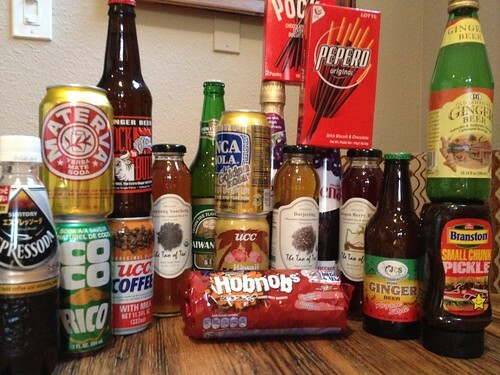 We have here several kinds of ginger beer, something called “Taiwan Beer” (actually alcoholic), a Yerba Mate soda, something called “Espressoda”, several kinds of canned coffee, three kinds of bottled tea, probably some sodas I don’t even know about, Pocky (Japanese stick cookies), Pepero (Korean stick cookies – we need to compare, after all), dark chocolate Hobnobs, a squeeze bottle of chunky Branston Pickle and two bottle of Ribena concentrate. We only expect to take home the last two items on that list. But if the Hobnobs make it home, I won’t be heartbroken.